POISED is an object which captures images using one laser and in real time another laser renders those images. It is a dual laser scanner, one raster is a camera and the other a projector. Presented is a prototype for a more expansive laser system, one which scans on a human scale and projects on an architectural one. POISED is a system which captures images using one laser and in real time another laser renders those images. It is both a camera and a projector. The final form of POISED will be a unique laser projection system for use as an interactive piece of emergent technology. A circuit receives reflected light off the camera raster from a photomultiplier tube, a highly photon sensitive component. This analog circuit sends those readings to an amplifier which increases the gain of that signal. That amplified signal is then sent to the projector raster, altering the brightness of the projection laser. Both the input and output lasers are synchronized in generating their raster scans, thereby scanning and projecting simultaneously. Z-BOLT OUTPUT LASER (included maquette housing). This Laser generates a raster scan the same as the INPUT laser. This one receives signal to turn on and off according to the Photo-receptor. It does so at video frequencies. EPOC - RESONANT SCANNER- This module resonates at X frequency. When the INPUT and OUTPUT lasers are pointing at the center of this mirror, they reflect a horizontal line at equal and opposite angles to their origin lasers. This line is created by the mirror on top oscillating laterally. PHOTON RECEPTOR: USED PHOTOMULTIPLIER TUBE AND AMPLIFIER - PMT - Pictured here also is the 532nm bandpass filter which isolates and allows through only 532 nm wavelengths. This PMT (photomultiplier tube) receives reflected light from the OUTPUT raster scan and translates photons into electrons. I will need to take the reflected light from the input raster scan area, in a way that will provide me with a workable image. Therefore I need to specify the lens and use that to focus the image to the active area of the PMT. The PMT outputs a bipolar waveform. The Amplifier circuit will have to contend with the output impedance of the PMT, perform a Full wave Rectification, and amplify the signal by a gain of approx. 2 volts. DIVIDER CIRCUIT WHICH SYNCHRONIZES THE RESONANT SCANNER TO THE GALVOS, provides the frame rate - resonant scanner outputs 15.75KHz, the galvos divide that value and are driven by this circuit with a phase-locked-loop at 29.97hz. This scanning system scans at NTSC frequencies. As such I have the Resonant Scanner oscillates at 15.75khz - in keeping with the NTSC frequency. The Resonant Scanner reflects both the Input Laser's and Output Laser's Collimated light in opposite angles to their origin Trajectory. Precisely placed Galvos reflect these horizontal lines vertically. In keeping with NTSC frequencies, the Divider receives the scanner frequency (in tandem with the resonant scanner) and divides the 15.75khz signal from the scanner by 329.97hz. To translate these numbers into computational ones, it is necessary to convert Hertz to milliseconds as both PIC Chips and Arduino platforms utilize time and not frequency. KiloHertz are units comprised of 1000 Hertz. To convert hertz to milliseconds, first determine the duration or period of one vibration (in this case - 15750hz) by dividing one second by the frequency. To Check our sanity check the math here. 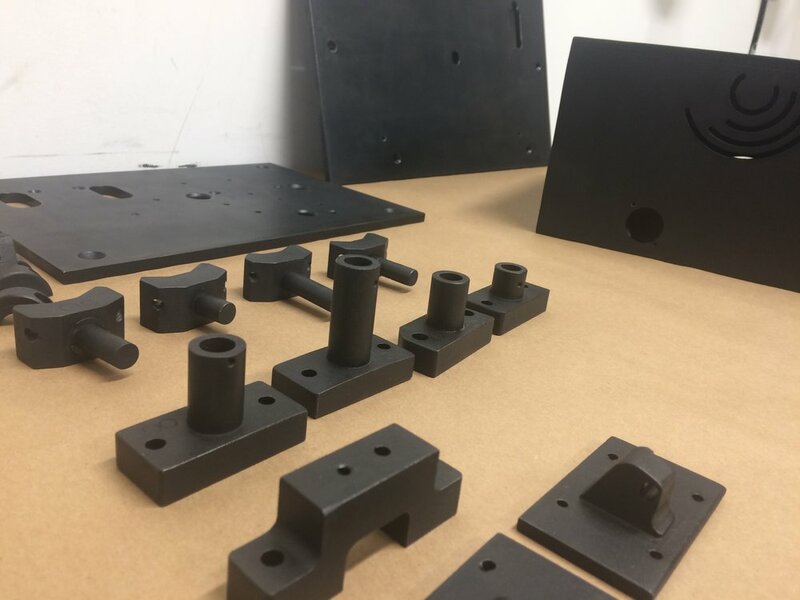 In scientific applications of this kind of imaging, most scientists would use a pre-fabricated mount for these components. I have fabricated mounts for these components as I need to adjust X, Y and Z of these components when setting up for scanning. 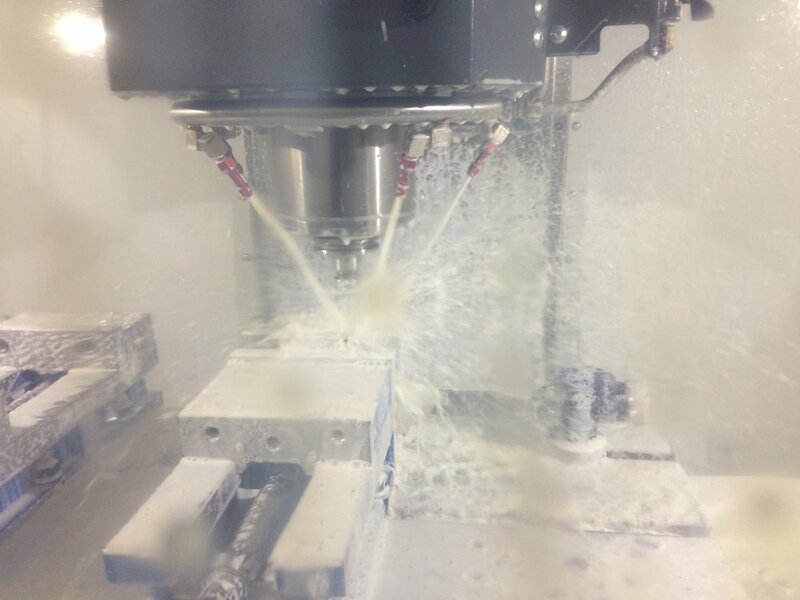 I designed a 3 axis gimbal-esque system machined from 7075 aluminum. 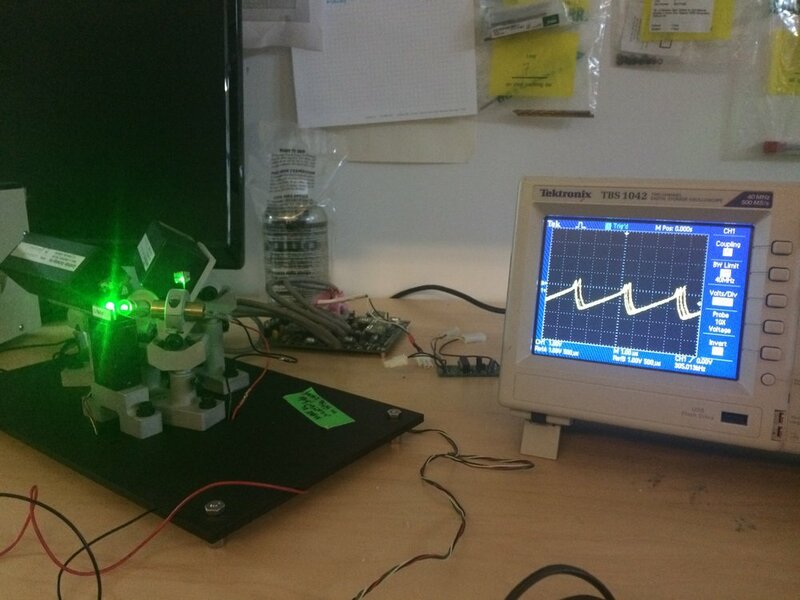 With this system I am able to calibrate the angles of the lasers and galvos laterally and horizontally: allowing a fine adjustment of the components in the optical field. When the Input Laser's light, while scanning - hits a surface, the 532nm collimated lightwaves bounce off this surface. Some photons are absorbed by the surface, but some bounce off - the amount of photons which bounce off from any given surface will vary based on the quality of that surface (i.e. shiny surfaces will reflect more and absorb less whereas a matte surfaces will absorb more and reflect less). These photons are received by the PMT through precise placement of the PMT and by filtering what the PMT receives through optical components. Photomultiplier Tubes are one of the few vacuum tubes to yet be replaced by silicone versions. They are ultra sensitive devices which when photons enter through the front face of the tube, move through a surface which gives the photon an electron-philic behavior. The tube has little fingers of metal preloaded with high voltage (i.e. tons of electrons hanging out on these fingers). As the photon bounces from electron-filled finger to electron-filled finger, it collects electrons, essentially translating photons into electrons. Once these photons have become an electronic signal, the signal is still weak, and for the signal to be significant enough to translate small variations in surfaces, this signal must be amplified. The Amplifier Circuit then increases the amplitude of the signal from the PMT and translates this to voltages which can modulate the Output Laser. I have been in conversation with an engineer at Hamamatsu who has helped me to determine which Photomultiplier Tube would best serve my application. Here is a catalog of Hamamatsu's Visible Spectrum Line of PMTs. Both Galvos and the Resonant Scanner have first surface mirrors. The PMT will receive light through a 532nm optical bandpass filter which filters all wavelengths except for the 532nm laser light, allowing the PMT to only receive light at the 532nm frequency -i.e. the reflected light from the Input Laser raster scan. I am using this 532nm bandpass filter. graph of filter - bottom values represent wavelength. I will be focusing the light through normal photographic lenses and will construct an optical assembly to contend with many of the imaging requirements. As depicted in the below graphic, the image/signal from the Input Raster Scan will be received as an inverted (upside-down) image/signal. Therefore, I will transpose the output galvo to begin in the opposite position of the input. When the input galvo is rastering top to bottom, the output galvo will raster bottom to top. This will present an image in the upright (not upside down). That image will remain mirrored, however. 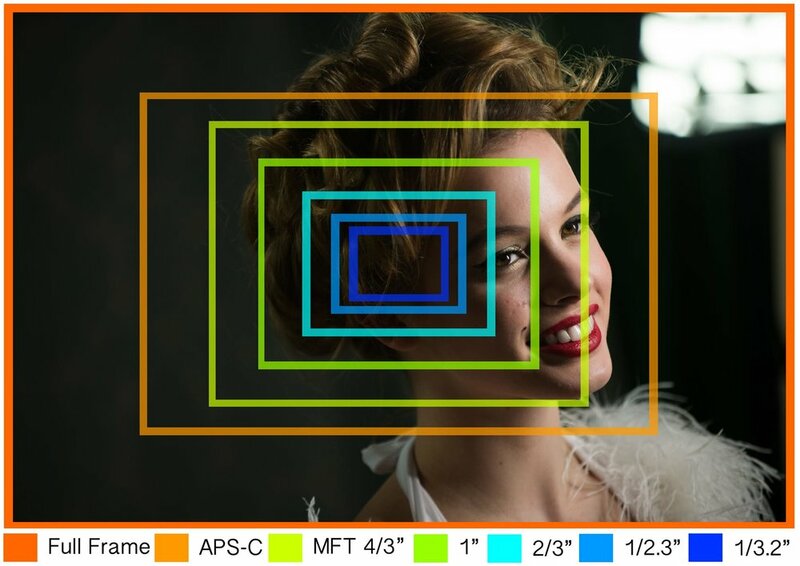 There are a myriad of things to consider when building a camera apparatus, including sensor size, focal length, focusing assembly, PMT protective covering and other light leakage concerns. 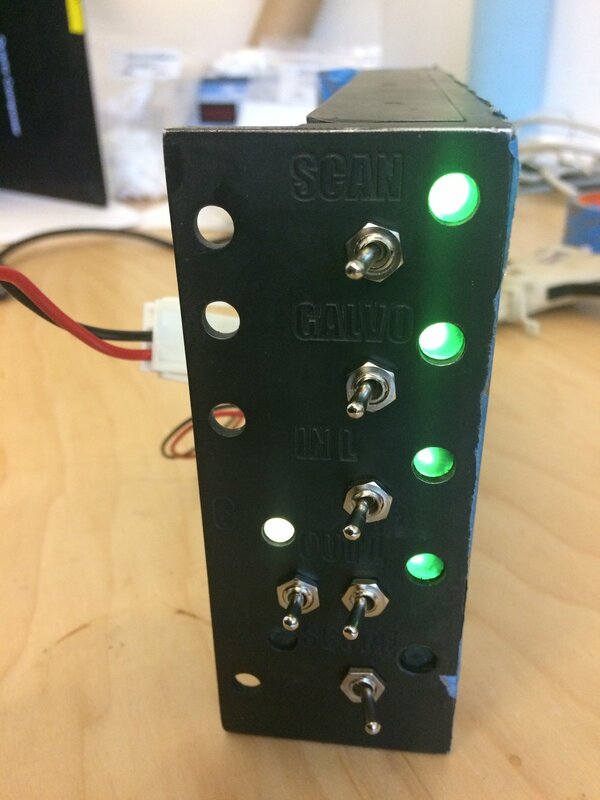 Please see this blog post on the process of configuring Gain from The PMT. The amplifier circuit requires more than gain. As the laser scans the area for imaging, the input voltages - there will be areas which reflect more and areas which reflect less. All areas will have details I wish to image. In other words, dark patches of an object being imaged still have variances I want to collect. Bright areas are the same. So, a simple threshold value will not be sufficient to tell the Output laser to go ON. That threshold value needs to compare itself not to a stagnant value, but rather a variable value which compares itself to the previous value. The Jones Divider, is a pic chip programmed for me by the famous Jones Video Synthesizers -used to divide the resonant frequency of the Resonant Scanner to create the 525 lines per frame for the Galvos. As it is a pic chip, I am unable to reprogram the duty cycle (the Galvos are non-responsive because the duty cycle is too high). I need the Galvos frequency to be synchronized with the Resonant Scanner frequency, I need to sample to the output sine wave generated by the Resonant Scanner and PID the output to the Galvos by checking in with the Resonant Scanner. The Scanner outputs a sine wave at analogRead values from 1-1023, as expected. The Resonant Scanner resonates, but has some variability in frequency. This means that the two components will eventually go out of phase with one another. To compensate for this digitally, by sampling the output of the Resonant Scanner, waiting for a rising edge of a wave, and then triggering a 29.97hz at 50% duty cycle waveform. At the end of that cycle, the code should re-sample the Resonant Scanner sine wave, and adjust accordingly. The code I am currently drafting will wait 6 times the target frequency (15.75Khz) - so that the Resonant Scanner will have enough time to begin to resonate (it takes a few seconds). Then the code will start a frequency count using this library. Once this frequency has been read, the Galvo signal will be derived from the frequency sampled, and be divided by 29.97. Using this library, I will produce a PWM signal at a specific duty cycle which is a direct derivative of the Resonant Scanner Frequency. The fallback of this logic is that I will no longer be producing a 30-frame-per-second video, but a 15 frame-per-second video. 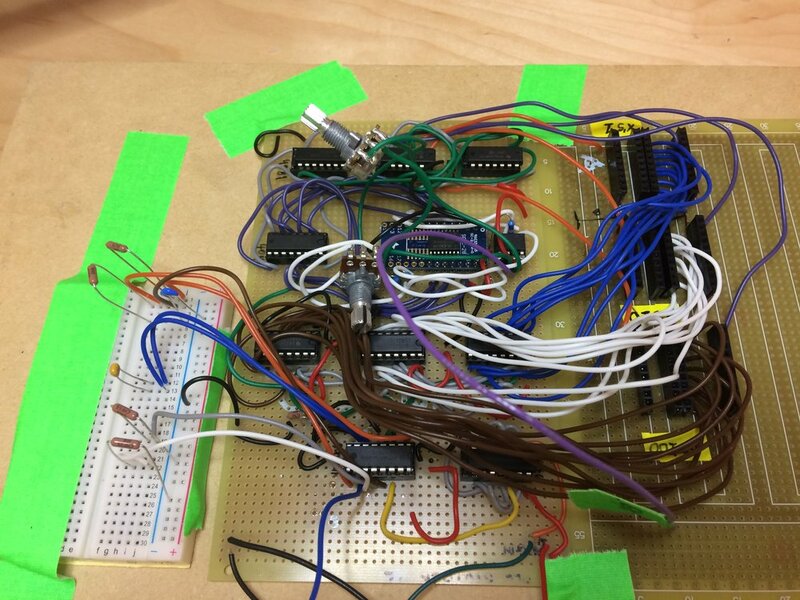 J. M. De Cristofaro has worked with me to develop a Circuit for this by working with a Phase Locked Loop, a Multiplier, and then Dividers with some Logic Gates - incorporating exclusively - IC's from the 4000 Series. The diameter of my photomultiplier tube will crop any resulting image. The size of the sensor will determine the size of the image I am able to capture (i.e. diameter of PMT will alter the image captured by the optics). I purchased a wide angle lens for a camera. I want to be able to capture (likely) about 2ft away to infinity. Here is the Ken Rockwell write up on the lens I chose. A Nikon 28mm f/2.8 AI-s with a manual focus. The way that lenses work, they focus the light into a tight and small area, and where that light becomes a point is the focal point. The PMT must be placed just at the focal point of the lens. 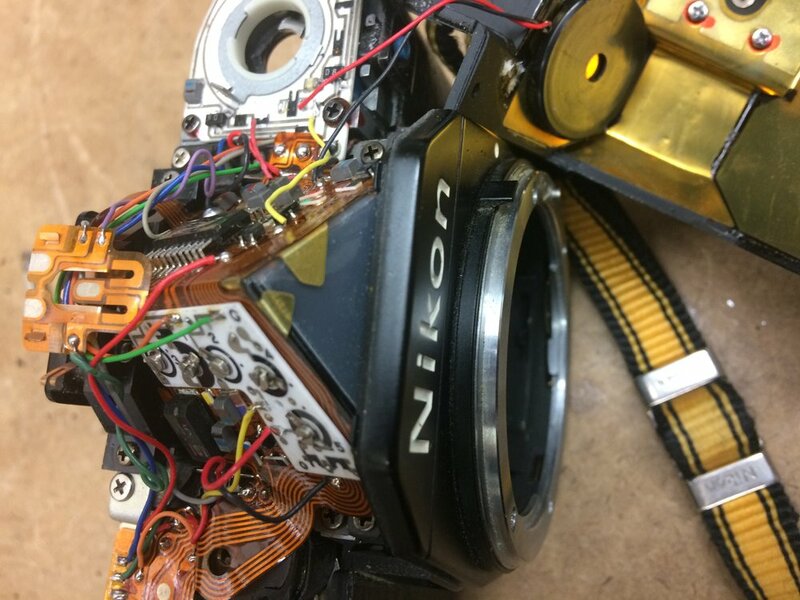 I purchased a broken Nikon 35mm camera, to break down and use specific parts. I need to use the lens mount from the camera. So I modeled the parts I need to adapt for this application. I also can use the prism from the eyepiece of to focus the apparatus when scanning. I will need to work on a mechanism to close the mirror (see below). 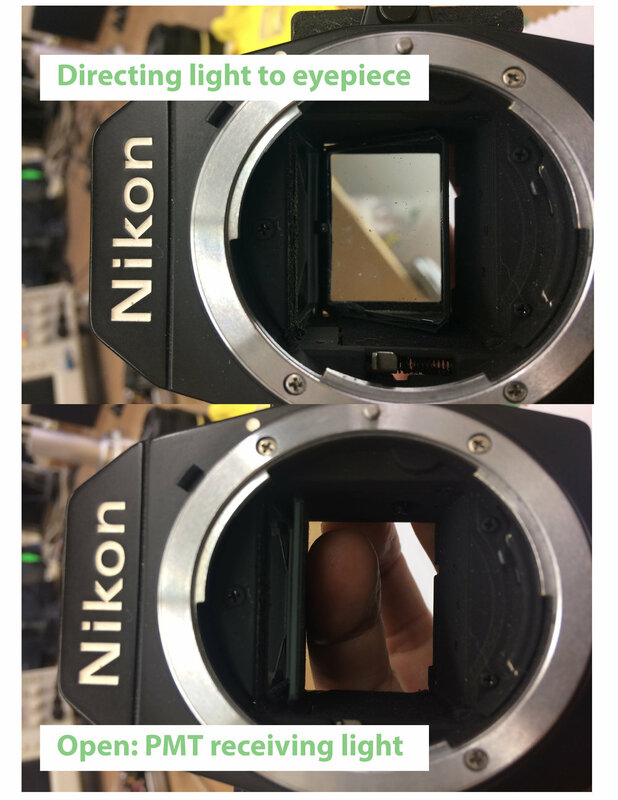 When taking a photo, snapping the image moves the mirror out of the way to expose the film behind it. I removed that mechanism as it was tied to the larger apparatus. The PMT I am considering purchasing has an active area of approx 1.5 inches. 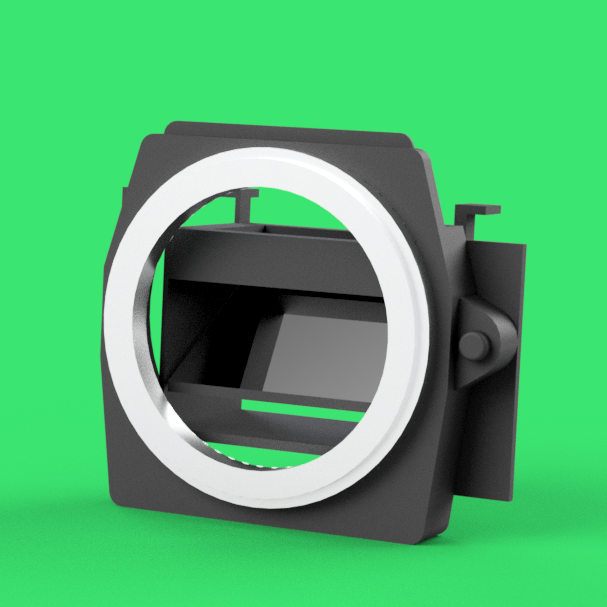 I want to create a shutter, protecting the PMT from any incident light. This may be attached to the mechanism of the mirror, or adding to that mirror. I then need to precisely mount the PMT to a stable position at the exact focal point of the 35mm assembly. I must also find some space in that enclosure to position my 532nm bandpass filter. Because having an in-focus input of photons will reduce the amount of variables I need to contend with, I need to verify that my optical situation is providing me in-focus light. In order to confirm that my PMT will be placed at the focal point of my optical assembly, I can use a cheap-o webcamera- remove all of its glass, and place the sensor exactly where my PMT will be. If the resulting image comes in focus, I can be sure my PMT will have crisp data at the outset. Lasers are highly regulated devices when engaging in the public. Each state in the United States has its own version of safety regulations and protocols. In New York State, Lasers are regulated by the Department of Labor. Specifically, Code Rule 50. In the United States, the national controlling body is the federal organization of the Food and Drug Administration (FDA), and here is where those regulations are. It can be very difficult to navigate these laws and regulations when trying to strike out on your own. In New York State, one must have a license to operate (what the DOL designates) a Mobile Laser. In order to be able to sit for the test for a Mobile Laser Operator's License, one must have 1 year of practical experience OR have taken a qualifying Laser Safety course. I took such a course to be able to sit for the Class B Mobile Laser Operator License (found at the bottom of this PDF for qualifying courses). formulas used for laser certification test.